During four days in September, the majority of the EviEM Secretariat attended the first global inter-sectoral and multi-disciplinary conference on evidence-based policy. 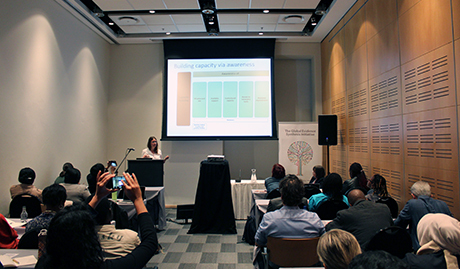 The conference took place in the heart of beautiful Cape Town, South Africa at the Cape Town International Convention Centre (CTICC), and it was arranged by Cochrane, the Campbell Collaboration, the Joanna Briggs Institute, Guidelines International Network and International Society for Evidence Based Health Care. Professionals working with or interested in evidence production, systematic reviews, research synthesis and evidence-informed policy and practice met to share knowledge, network and exchanging ideas about how to best generate, summarize and communicate evidence to inform policy and practice. The +1000 participants came from across the world and represented a range of sectors including medicine, health care, international development, education and environmental management. 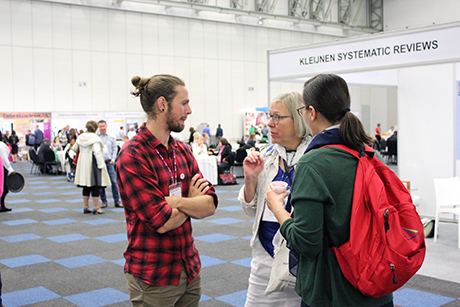 Participants networking in the exhibition hall. Photo: Karolin Andersson. During the four intensive conference days, five members of the EviEM Secretariat not only attended a range of highly relevant and interesting sessions and workshops but also presented and led several of them. Biljana Macura, EviEM Project Leader, held an appreciated presentation on experiences and challenges of building capacity in systematic reviews in environmental management. Neal Haddaway, Project Leader and Research Coordinator at EviEM, was leading a well-attended special session on different approaches to evidence mapping across disciplines. Biljana Macura presenting at one of the sessions. Photo: Karolin Andersson. In addition, EviEM’s Director Sif Johansson presented on stakeholder engagement and ownership in systematic reviews. Sif and Neal also chaired and presented at a session on incorporation of evidence synthesis methodology into environmental decision making. On top of that, five posters were presented by Biljana, Neal, Karolin Andersson (Project Coordinator) and by Magnus Land (Project Leader). You can view the posters here. 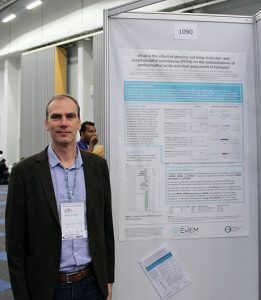 Magnus Land in front of his poster. Photo: Karolin Andersson. The conference resulted in new knowledge, ideas and contacts that will be useful for the future work of EviEM, for instance we met up with representatives of the Africa Evidence Network, Global Evidence Synthesis Initiative and CEE in South Africa. The week also brought many good memories not the least from the excellent entertainment arranged during the conference days. Neal Haddaway, Sif Johansson and Natalie Rebelo Da Silva in a discussion. Photo: Karolin Andersson.